Deep in the blazing tropics of Mystery Island lies the Trading Post, hosted by Jhuidah! This is where Neopians can go to swap their items and Neopoints. Here, you can spend larger amounts of NP than you can in people's shops, and you can also exchange items for other items -- both these things make the Trading Post an excellent place to buy and sell expensive items. If you're interested to see how trading compares to auctioning, check out our guide to the Auction House here. Let's start with the basics. The first thing you'll see at the Trading Post is the button to create a new trade -- without this, the whole system wouldn't exist! So what does creating a trade mean? Simply stated, it's putting some items from your inventory on display so that other Neopians can offer you their own items and Neopoints in exchange. For example, I can put up a Puppyblew for trade. 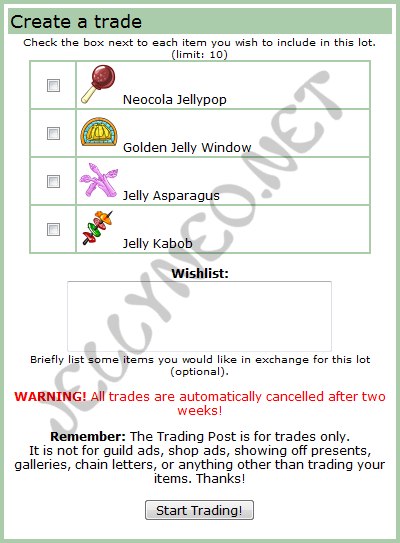 Then other users can offer items and neopoints to trade for my item. One person might offer me a Caylis Lamp and 30,000 Neopoints. Another Neopian might offer me three Yellow Eyrie Yoyos... and so on. I get to choose which offer I want to accept, giving me full control over how much profit I make. Please note that you can only have a maximum of 15 trades listed at a single time. You'll see a list of the items in your inventory (or the first 50 items, if you happen to have more than that). Check the items that you want to put up for trade. You can have up to ten items in one trade. Keep in mind, though, that it's a good idea to put related items together, rather than throwing in a mixture of random items just because you happen to have them with you at the time. You cannot put items from the NC Mall up for trade at the Trading Post, nor offer Neocash for other people's trades. If you want to send a NC Mall item to another user, you'll need to use a special gift box. Check out our guide to NC trading for more information. Underneath the list of your inventory items, there's a box where you can type your wishlist. This is a short description of what kinds of items, or how many Neopoints, you'd be willing to receive in return for your item. This will give other traders ideas of what they can give you to ensure a successful trade. You can also include other information that traders should know, such as whether you'll accept the highest offer you get within ten minutes or whether you're going to wait a while and see what offers come in. If your trade is meant for a specific user, or if you'd prefer people to Neomail you to talk about possible offers, this is also the place to do it. It's also worth noting that certain symbols will automatically be taken out of your wishlist. At the time of writing, this includes apostrophes. Highest bid wins! Looking for [insert what you want here]; no junk offers please! After you're done with your list-checking and wish-listing, click the button to create your own trade! You're ready to enter the world of accepting and rejecting offers! Depending on what items you have up for trade, people may flock to it within a few minutes, or it may take a long time for anyone to offer. You have two weeks to receive offers before the trade lot is automatically cancelled, but don't worry; if your trade lot is cancelled, there's nothing to stop you from simply putting up another trade using the same items and wishlist. If a user offers an item on your trade, it's probably a good idea to search the Shop Wizard and Trading Post to find out what that item's currently worth before you accept. Of course, it's up to you whether you want to accept an item that's worth less than your trade, but most people want to accept an offer of equal or greater value. If you're not sure of an item's worth, try asking around on the Neoboards. You can, of course, specify in your wishlist that you're only interested in Neopoints, not other items. This works best for items that cost more than the maximum price allowed in user shops (999,999 NP) but less than the maximum Trading Post limit (2,000,000 NP). If you want more than this for your item, you'll either have to use the Auction House, or accept a mixture of Neopoints and items and then sell the items. One easy option is to ask for one or more Baby Paint Brushes as part of the offer; the Hidden Tower keeps these brushes' price fixed at around 580,000 NP each, and since Baby pets are very popular, it's quick and easy to find a buyer for them once you've got them. If you don't like an offer, you have the option to reject it. There's nothing rude or unkind about doing this -- in fact, it's good manners to reject offers you don't want as soon as possible, so the trader knows what you think and can make another offer or buy elsewhere. Keep in mind that traders can sometimes be impatient people. Occasionally a player will withdraw his or her offer if s/he doesn't get a response within a few minutes, usually because s/he is in a hurry to buy something. Don't worry too much if this happens to you; if your trade has brought in one offer, it will probably bring in more. Just be patient! Finally, if you suddenly realise you don't want to trade your item after all -- or you just want to change the wishlist -- you can remove your trade from the listing after fifteen minutes. Now you know how to create trades, it's time to learn the other side of the Trading Post: browsing lots. The first thing you should do is make sure you know the exact name of the item you're looking for, whether it's a Blue Cybunny Plushie or an Obsidian Dagger. Once you have the name, you can type it into the Trading Post's search bar. You have the option of seeing the newest trades matching your search first, seeing the oldest first, or viewing trades in a random order. Most of the time, you'll probably want to see the newest; that way, you'll know the current price of the item you're looking for rather than the price from a week ago. If you really don't know what you want to trade for and just want to 'browse', there's also an option that will display the latest twenty trades. Okay, so you've found that item you were looking for! Now it's time to make an offer! Underneath every trade lot, you'll see the "Make an Offer" button. Click on it, and you should be taken to a page that looks very similar to the 'Creating a Trade' page. Here, you can choose which items you want to offer, and whether you want to include any Neopoints. The current Trading Post maximum offer is 2,000,000 NP per lot. However, there is a special boon that can be won when backing certain factions at the Battleground for the Obelisk; activating the That Millionaire Feeling boon allows you to offer more, however the exact amount is still unknown. If the trader is seeking more than that amount of NP, you'll need to go through the Auction House. Typically an auctioned trade (with a pre-agreed price) would be set up as Neofriends Only. Auctions are set up with an opening bid and a minimum increase; the first possible bid is the opening amount plus the minimum increase, so make sure it's set up so that they total the amount that was agreed upon! You must offer at least one item when bidding on a trade. If the owner of the trade is only interested in Neopoints, you can send them along with a cheap item, such as a boot or some seaweed. You can only offer items that are in your inventory, so be sure to take anything you want to offer out of your Safety Deposit Box before you trade. When making an offer, keep in mind what was written in the wishlist for the trade lot. If the trader made a vague request and you're not sure whether s/he will like your offer or not, it's fine to try it and see; however, don't make any offer that the trader has specifically said s/he doesn't want. Be sure to research how much your offer adds up to, and don't offer much less than what the trade lot is worth. This is an easy way to get yourself rejected and blocked from offering again! Once you've made your offer, all you have to do is wait. If the trader accepts your offer, the item(s) you bid on will be placed in your inventory; if not, you'll get whatever you offered back either when s/he rejects it, or when the trade lot is cancelled after two weeks. Because of the limited amount of space available in wishlists, Trading Post users have developed a few terms of their own. Here are some of the commonest ones! ETS - "Easy To Sell". This refers to items that are generally in High Demand (such as Codestones, Bottled Faeries, Dubloons, etc.) and usually require very little effort to sell. HTS - "Hard To Sell". This refers to items that are generally less popular and require more time and effort to sell. NFT - "Not For Trade". Strictly speaking, only items for sale are allowed to be displayed on the Trading Post, and you may receive a warning if you put items up in the Trading Post and explicitly say they are not for trade. Reserved - Don't offer on this lot. A user posting this has already decided whom to sell his/her item to, and is waiting for that person (and no-one else) to make an offer. Auto - This means if you're the first to offer what's mentioned in the wishlist, then you'll be guaranteed a successful trade! Neomail to Haggle - If a trader puts this in his or her wishlist, it means that you shouldn't offer on the trade first but instead Neomail the user and tell him/her what you were planning to offer. S/he will mail back to suggest an offer s/he would like, and hopefully the two of you can reach an agreement somewhere in the middle! No Junk Items - Okay, so what is a 'junk item'? Pretty much any item on the site that can be gotten for free. This includes (but is not limited to): Tombola booby prizes, Giant Jelly jellies, Giant Omelette omelettes, Coltzan's Shrine food, Advent Calendar prizes and Underwater Fishing prizes. The reason why these items are 'junk' is because since they're given free to every Neopian in Neopia there is mass inflation, so the prices of these items go way down. Pure - Usually followed by a number of neopoints. This means that the trader would prefer only neopoints in your offer and not items. Rot - This refers to when a trader will not respond to an offer (neither accept nor reject it). Usually done to undesired 'junk offers' and meant to be... a tad vexing. However, just because a person doesn't respond right away may just be because they're thinking over different offers or simply logged off. Unfortunately the Trading Post -- like many other things in life -- is targeted by scammers who want to trick unsuspecting users like you out of Neopoints and items. Here are some evil tricks you should watch out for if you're planning to trade. If you see anyone trying to pull one of these scams, the best thing to do is to report him or her to the Neopets Team. Our scammer (let's call her "Jhudora") puts up a trade containing a rare and valuable item. As soon as a user (let's call her "Illusen") makes an offer, Jhudora cancels the trade. Then she Neomails Illusen, explaining that she cancelled the trade by accident, and that she's put up a new trade to replace it. Naturally, Illusen still wants to trade, so she goes to the new trade and makes the same offer. However, the new trade lot is not the same as the old one! It contains an item that looks a lot like the rare and expensive item Jhudora was originally selling, but is worth a lot less. Of course, Jhudora immediately accepts the offer, before Illusen can notice the difference. The result? Jhudora has made a lot of money without actually having to part with her rare item, and Illusen is stuck with an item she didn't want to buy. Luckily, it's easy to protect yourself against this scam. Just make sure you have the name of the item you want to buy memorized, and double-check that it matches the item in a trade lot before you make an offer. Many items in Neopia look like they should be magical or special, but are actually quite boring and useless. A common scam is to put one of these items up for trade, claiming (in the wishlist or on a page with a link to the trade) that it does something awesome, and asking for a high price. A good example would be the Cherry and Oak Wish Sticks; these are just pretty souvenirs that don't do anything, but because of their names and descriptions, you'll often find scammers claiming that they give you better luck at the Wishing Well or help you win at chance games. If a seller claims an item will change your Neopet's species or colour, you can check his/her claim against our article on Items That Alter Your Neopet. I once saw someone selling Garin Neggs, claiming that they would turn any pet who ate them into a Pirate Usul. Believe it or not, at the time, Usuls couldn't even be painted Pirate! Sorry guys, but I can't just let other Usuls have my dashingly good looks, now can I? Remember: if it sounds too good to be true, it probably is! If you're not sure what an item is worth, use the Shop Wizard or search the rest of the Trading Post to see what other people are asking for it. Another common twist on this scam is to take one of the cheaper openable items and claim it gives out something incredibly valuable, such as Paint Brushes or rare weapons. There are a few items that really can give out expensive prizes, but most don't do anything of the sort; check our article to establish what kind of items you might really get, and don't pay for an empty promise! Offer On This And You Win! Our scammer friend Jhudora puts up a cheap item for trade, and tells everyone that by offering on it, they are entering to win a prize (usually a much more expensive item). Supposedly, the prize will go to the person who makes the highest offer. Of course, Jhudora doesn't intend to give the prize to anyone; when she gets an offer she likes, she will simply accept it and then ignore any messages about the supposed competition. This scam is sometimes also done in user shops, with Jhudora claiming that buying her overpriced items will enter users into a prize draw. Again, there is no draw and no prize (although Jhudora may well enlist a malicious friend to pretend to be the "winner", to make people less suspicious). The only winner here is Jhudora, who gets to run off with everybody's money. Remember: only offer for what's in the trade lot! This is another variation on the scam above. This time, crafty Jhudora doesn't offer an item, but a "secret" that will supposedly help Illusen gain huge amounts of money. And all Illusen has to do is offer a rare item or some Neopoints on Jhudora's trade! What could be the catch? There are no secret codes or pages that will magically give you access to mountains of free Neopoints. While there have been bugs on the site in the past that have accidentally allowed people to gain lots of free stuff, taking advantage of these gets people FROZEN. So when Jhudora tells you her supposed "secret", there are only two possibilities: either it won't work, or it'll lead to you losing your account! Doesn't look like quite such a great deal now, does it? Think about it: if Jhudora really did know how to get as many free Neopoints and items as she wanted, why would she be asking other people to send her stuff? Again, only offer for what's in the trade lot -- not a promised secret. Unlike the scams above, which are perpetrated by Neopians as evil as Jhudora, this kind of message is often posted by honest, naive players. It's not hard to see why. As you can see, this message promises riches and glory, and all you have to do is copy and paste it ten times, right? Wrong! These are known as chain messages, and whether they're in trade wishlists, in shops, or on the Neoboards, they DO NOT WORK. They are just pointless, annoying messages full of fake promises. We'll say it again: there are no secret ways to magically gain huge amounts of money. Once you've copied and pasted the message ten times, you'll find that absolutely nothing happens -- but by then, the message may already have fooled someone else into copying it! The Neopets Team do not like chain messages at all, and have been known to warn, silence or even freeze people who pass on too many. So don't copy that message, no matter how tempting it sounds. You won't get the NP, and you may get into serious trouble. And so that concludes this rather lengthy Trading Post guide! Hope you've learned something and if you haven't perhaps the official Neopets Trading Post FAQ could help you out!